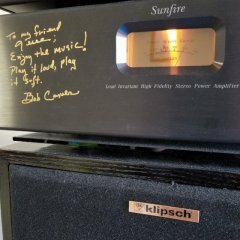 I have a pair of Klipsch speakers and I do not know the model and can't see a serial number. They were purchased about 1986. Any ideas? One woofer has been injured and needs replacement. Any suggestions. Pictures would help greatly in figuring it out. There is a rear facing speaker also. I didn't see any original woofers for sale but I'm sure they pop up from time to time, good luck! 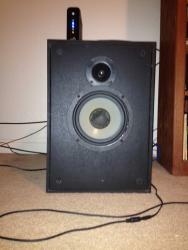 Does it need a new woofer, or is the dust cap just wrinkled? WVU80 = The woofer has a rumble it. I think my son damaged it with his musical selections. The specs say 18.9" (48cm) x 13.25" (33.7cm) x 11.5" (29.2cm) for a KG2, pretty close.